The Linksys Business Wireless-N (LAPN300 and LAPN600) and Wireless-AC (LAPAC1750, LAPAC1750PRO, LAPAC1200 and LAPAC2600) Access Points (APs) have the latest Wi-Fi technology to offer a powerful wireless network. These access points provide a secure, high-speed wireless connectivity, and advanced security and management features so employees can bring their own devices to work, and can stay connected across the workplace. IMPORTANT: As a security feature, access to the web-based setup page using wireless client devices is disabled. This feature can be enabled once you have gained access to the web-based setup page of your access point using an Ethernet cable. If you want to enable access via wireless client, you will need to manually enable this option in the access point. In this scenario, the access point is NOT connected to a router or to a network. Connect an Ethernet cable from your access point to your computer. Make sure that the LED light is lit on your access point. Assign a static IP Address on your computer. To learn how, click here. IMPORTANT: When assigning a static IP Address on your computer, use an IP Address that is within the range of your access points default IP Address. An example of this is 192.168.1.10. NOTE: The default IP Address of the Linksys Business Access Points is 192.168.1.252. The default Subnet Mask is 255.255.255.0. Open a web browser, type 192.168.1.252 in the Address bar and press [Enter]. On the authentication window that will appear, enter the default username and password “admin” in both the Username and Password fields then click Log in. 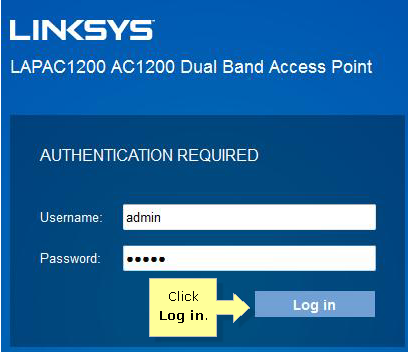 NOTE: In this example, the Linksys LAPAC1200 AC1200 Dual Band Access Point is used. You should have accessed the web-based setup page now. NOTE: The following steps are only applicable to the Linksys Business Wireless-N (LAPN300 and LAPN600) and Wireless-AC (LAPAC1750, LAPAC1200 and LAPAC2600) Access Points. These do not apply to LAPAC1750PRO. To enable wireless access to the web-based setup page, go to Configuration > Administration > Management Access. Check the Enable box for the From Wireless option and click Save to apply the changes. NOTE: When you have finished configuring your access point, ensure to remove the static IP settings that was assigned to your computer. You should now have the capability to access your Linksys Business Wireless-N or Wireless-AC Access Points using both wired and wireless client devices. In this scenario, the access point is connected to a router or to a network. Using a computer that is connected to the network, verify the IP Address assigned to the access point in the Dynamic Host Configuration Protocol (DHCP) client’s table of your router’s web-based setup page. To know how, click here. If you are using a Linksys Smart Wi-Fi Account, click here. NOTE: The device name, which you will find in your DHCP client’s table is “lapXXXXXX”, where XXXXXX is the last six (6) digits of your access point Serial Number (SN). For Linksys LAPAC2600, the device name has the last five (5) digits of your access point’s Mac address. Open a web browser, type the IP Address assigned to your access point in the Address bar and press [Enter]. On the authentication window that will appear, enter “admin” in both the Username and Password fields then click Log in.